This newly patented energy saving product is made of vacuum cast insulation material, utilizes infrared heat, and incorporates a unique cooling system that allows heat drawn from the barrel to be used elsewhere in the plant. This new heater is made entirely of electrically non-conductive vacuum cast insulation material. It utilizes efficient infrared heat, is designed to cover the complete barrel, insulates extremely well, and offers a unique new system for cooling that can tap into the heat drawn from the barrel and use it elsewhere or remove it entirely from the plant. The uniqueness of this system prevents hot air from being dispensed into the plant environment. This new heater will definitely fill a niche/void in today’s plastics industry of escalating energy costs and more and more emphasis being placed on working environment safety. Energy is saved by maximizing heater efficiency. A fully insulated barrel assures that a much greater percentage of Insul-Watt’s infrared radiant heat is contained and directed into the barrel; thus, the barrel heats up faster, the heaters are not on as often during actual production, and far less energy is required. 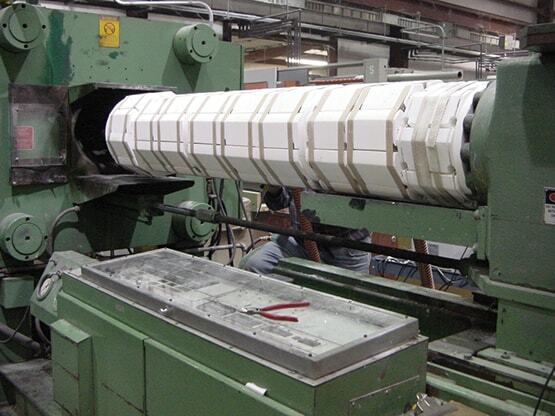 Also, Ceramic Bead, Mica, or Cast heaters must first heat themselves---and then conduct heat to the barrel. Not so with Insul-Watt heaters! When our infrared heaters are on heat is immediately transferred to the barrel. Conversely, when our heaters are off there is an immediate cessation of heat. Tests show that it is not at all uncommon for heater energy costs to be reduced by over 50% in both start-up and production modes. Safety from burning or exposed electrical connections is dramatically improved through design. The insulation body of the heater reduces the “cold face” temperature significantly and enhances safety. A "hot face" temperature of 400°F, depending on plant environment, will result in a production "cold face" temperature of approximately 110°F to 115°F. You can lay your hand on the “cold face” and feel a comfortable warmth---far different than the Mica, Cast, or Ceramic Bead heaters sold in the market today. Also, the electrical connections are all recessed, thereby virtually eliminating any bare wire exposure. Working environment comfort and safety are the natural results of far less heat escaping into the plant atmosphere. Mica Band and Ceramic Bead conduction heaters release almost as much heat into the air as they do into the barrel. The insulation body of the Insul-Watt heater is made of sufficient density and thickness to offer optimum insulating values. The results are a heater you can actually touch without getting burned and far less heat escaping into the atmosphere! Imagine the cost savings if you are air- conditioned! Greater heat consistency is also achieved. In contrast to Ceramic Bead, Mica, and most Cast heaters, each which cover only a certain portion of the barrel, Insul-Watt heaters, with complete barrel coverage, capture the heat and assure an even distribution throughout the barrel. An even distribution virtually eliminates “cold spots” within the barrel; thus the resins move through the barrel melting as designed and giving a consistency that maximizes production. Our customers have confirmed time and time again the attributes of a thorough heat saturation of the barrel. The Insul-Watt heater was designed to give that quality. This heater is designed for longevity, thus increasing production by eliminating the usual downtime and re-occurring costs associated with replacement of standard Mica Band or Ceramic bead heaters. The element material, heater design, and an element wire that is 3 to 4 times thicker than that used in standard Mica or Ceramic Bread heaters result in a heater that will last far, far longer. Our earliest prototype model of heater was on a barrel for over two years before replacement with a newer design, and not one heater had to be replaced. Current production methods only enhance what we believe to be a significantly extended lifespan. Cooling is achieved through a unique new system utilizing a vacuum to draw the heat away from the barrel. Current technology requires that heaters typically fit tightly against the barrel. They also utilize conduction heat, do not cover the entire barrel surface, and have a mass that retains heat for a period of time after they’re shut off. Cooling fans blowing air across the barrel must also then cool the mass of the heaters as well as the portion of the barrel not covered by the heaters. This results in a reduction in the efficiency of the cooling. 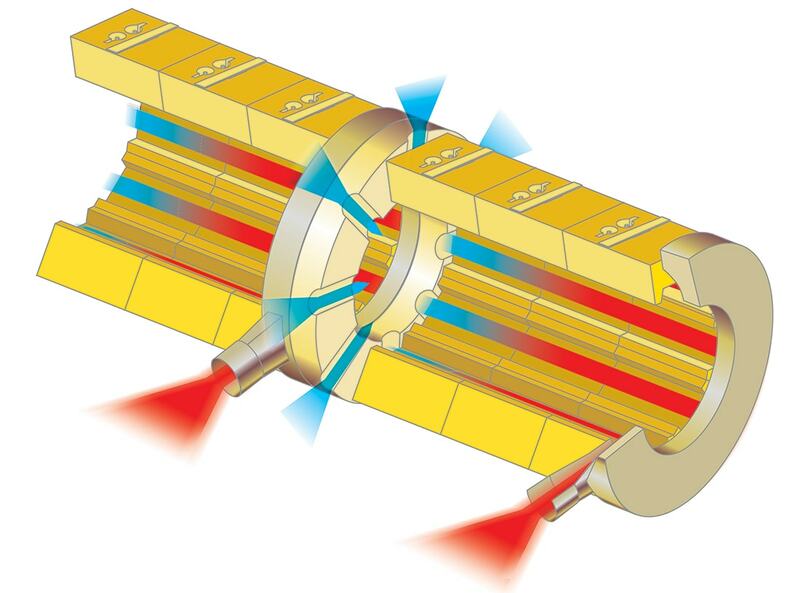 Cutaway of the Insul-Watt unit shows IR heating elements and ceramic-fiber insulation in modules separated by an optional vacuum cooling ring. We’re confident that we’re offering the plastics industry a barrel heater that under typical conditions will last much longer. The heating elements and connectors are of a design that is meant to add longevity. The heater design itself, covering the entire barrel with heaters made of insulating material, and utilizing efficient infrared radiant heat all add to the heater’s life by reducing the energy required in both start-up and production modes. The idea of a heater that could heat, insulate, and have a cooling option was conceived in late 1998. After a great deal of research it developed into a solid concept in early 1999 and a patent was applied for late that year. Once the patent was applied for the new heater was shown on a limited basis at various trade shows around the U.S.; we sought comments and impressions from a variety of processors throughout the country. The responses were positive and we continued to fine tune our design as the patent process proceeded. In September of 2002 we were notified that the patent had been accepted and would be issued shortly; ultimately issued on November 26, 2002. We currently have additional patents pending in the United States and other countries as well. Insul-Watt heaters are shipped with each circumferential group of heaters pre-wired with Hi-Temp wire. It is then just a simple matter of fitting them around the barrel and drawing them tight. Hi-Temp wires connecting each circumferential band to its energy source are clearly marked and long enough so all connections are easily completed. A wire tray can be installed, thus minimizing wire exposure and increasing safety for your employees. Our customers have expressed an appreciation for the ease and simplicity of installation, and full barrel coverage can give an entirely different look to your equipment.